The start yesterday of CMA CGM’s Columbus Loop service regular call to Halifax, has added a unique cruising opportunity. the 71 day Cruise is on the eastbound route, and sails sails Halifax – New York – Norfolk – Savannah – Suez Canal – Port Kelang – Vung Tau – Hong Kong – Yantian – Shanghai – Ningbo – Pusan – Seattle – Vancouver. This takes 71 days, the longest stretch of which is 37 days from Savannah to Port Kelang. Halifax passengers will board at the Halterm container terminal. The shorter route is westbound: Vancouver – Nadkhodka – Shanghai – Hong Kong – Yantian – Vung Tau – Port Kelang – Suez Canal – Halifax. The time in transit is 55 days, the longest stretch of which is the last 23 days from Port Kelang to Halifax. Vancouver embarkations take place at the Deltaport container terminal, near BC Ferries’ main Vancouver-Victoria terminal at Tsawwassen. Fares including port charges are €100 per person per day. Vessels include a Gym, Library, Pool and Lounge. 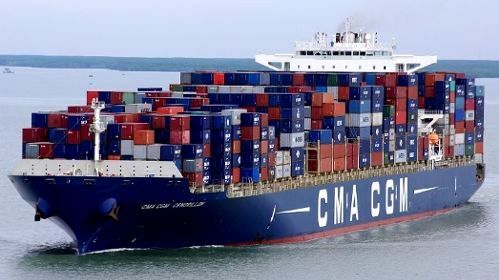 For further details on booking a voyage on CMA CGM’s Columbus Loop please contact Miri Lopusna at The Cruise People Ltd in London on +44 (0)20 7723 2450 or e-mail cruisepeopleltd@aol.com. This entry was posted in CMA-CGM, container ship, cruise ship on August 4, 2015 by Peter Ziobrowski.